“Never forget that all of us are signs of the Father. We need one another to move forward,” spoke Pope Francis in a recent address. This message has not gone unheard by the Presentation Sisters, and particularly by those working in the area of justice issues, which Sister Joetta Venneman has been doing since 2004. Joetta, daughter of Francis and Janet Venneman, was born in Vinton, Iowa, where she graduated from Benton Community High School in 1982, and then Mount Mercy University, from which she graduated in 1986 with a major in mathematics and a minor in education. Joetta is the oldest of her siblings, Jacqueline, Janice and Joseph, all of whom are married, gifting Joetta with three nephews. Joetta knew the Mercy Sisters who staffed the university and she also became acquainted with Sisters Dominic Church and Richelle Friedman, both Sisters of the Presentation who taught at Regis High School in Cedar Rapids, Iowa. Joetta had been active in liturgy, serving as a reader both at her home parish and in college, and church was important to her. Thus it was not a surprise that she felt called to explore religious life. Wisely, she made contacts with several communities, including a cloistered community in which she had some interest. She made a retreat weekend with the Presentation Sisters, and also went with them to teach in vacation bible school for a few summers. On several occasions, Sister Dominic brought her to the Presentation motherhouse in Dubuque, where she became acquainted with many sisters, including those in formation at that time. She appreciated what she experienced there, particularly the joy which was alive among the sisters, and eventually she made a decision to enter the community. Having already completed college, Sister Joetta began teaching in Peosta, Iowa, after her first two years of formation, and remained there for three years. She then went to Chicago where her heart was drawn to those lost in the big city who had needs that challenged her. She taught Hispanic children at Our Lady of Guadalupe School, and then taught black and Hispanic children at St. Michael the Archangel, both schools in South Chicago. While in South Chicago, Sister Joetta earned a master’s degree through a long-distance learning program in human and organizational transformation. After that she desired to pursue work in the social justice field, but that did not happen immediately. She put some variety into her life by doing parish work and individual tutoring for students who were in need. She also served as an adjunct professor in education and math, helping future teachers with curriculum at Calumet College of St. Joseph in Whiting, Indiana. During that time she made efforts to connect and meet others in social justice. She lived for a time with the Poor Handmaids of Jesus Christ in Indiana, who were involved in a variety of ministries. One of them went to minister in Mexico, and, as she shared her experiences, Sister Joetta was again exposed to the needs of the less privileged, and she gained impetus to begin ministering to those she found right in her own school environment. She also came to know the Sisters of Charity of Nazareth in Kentucky, and she found them to be “in sync” with the needs of people who were less fortunate. Additionally, however, the Sisters of Charity have sisters in India, Botswana, Belize, Nicaragua and the United States, several of whom are engaged in efforts to meet the social needs of the world, and this again appealed to Sister’s desire to be in the social justice ministry. So it was not surprising that Sister Joetta found her “niche” by becoming the social justice coordinator for these sisters in 2004. She works with a global ministry team which helps her integrate the work of justice with the individual ministries of the sisters. She does much work with coalitions which provide her a broader network on a variety of issues. 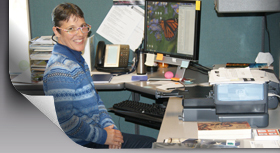 She helps to formulate strategic plans to implement the congregation’s directives, mission and corporate statements. Sister Joetta keeps the community informed about relevant legislation, and presents it through the lens of the sisters’ directional statement and community directives. The sisters are persistent about pursuing justice through such means as writing letters, making phone calls, sending emails and joining with coalition groups to be even more powerful. They believe that their voice is crucial to forming the mind of legislators and to effect systemic change. Sister Joetta sends an “Action Alert” monthly to the community. She offers a spiritual emphasis on a given topic around a justice issue, and highlights that issue in a way that invites engagement. She has hosted candidate forums, which include information from the candidates’ websites, and the Faithful Citizenship document as a basis for discussion questions. However, Sister is not a “one-issue” person! She rounds out her life by enjoying such activities as hiking, sledding, gardening, photography and reading. She loves camping and just being in the outdoors, which draws her into deeper intimacy with her God. She agrees with Pope Francis, who recently urged, “I invite you once again today to be on the front line …” Religious women have, for centuries, been on the front line of many endeavors, but the push for social justice is a relatively new venture, which Sister Joetta enjoys making first and foremost in the minds of the Sisters of Charity and of her own Sisters of the Presentation. Left photo: Sister Joetta Venneman enjoys coordinating social justice work for the Sisters of Charity of Nazareth in Kentucky. Right photo: Sister Joetta Venneman (front middle) stands with a group of Sisters of Charity of Nazareth at an “I Love the Mountains Day” rally to advocate for legislation to protect streams and waterways.